“Thunderclouds” is a song by LSD. Lyrically, this track deals mainly with the important issues of fear, distrust and anxiety that characterize many a romantic relationship. There are two narrators/singers in the song: Sia and Labrinth. Each of the narrators tries to reassure their significant other that their love is real and that they should trust them and let go of all fears and anxiety. LSD is a super-group made up of British singer Labrinth, American DJ/producer Diplo and Australian singer Sia. The group was created in 2018. The group’s name (LSD) comes from the first letter in each of the names of its members. L stands for Labrinth, S stands for Sia and D stands for Diplo. “Thunderclouds” was written by all three members of LSD (Diplo, Labrinth and Sia). American record producer/songwriter King Henry and German record producer/songwriter Jr Blender also contributed to the writing of the song and thus receive songwriting credits on this track. Diplo, Labrinth and King Henry handled the production of this tune. The tune was officially released on August 9th, 2018. 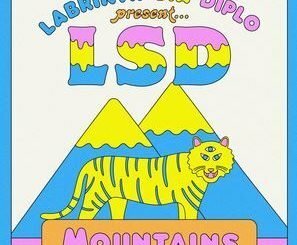 It is the third single from LSD’s debut album. Three days prior to the song’s official release, Sia teased it much to the delight of her and the group’s fans. Sia and Labrinth sing the vocals of this track. “Thunderclouds” gained wider fame after Samsung used it in a number of ads for their Android smartphone, the Samsung Galaxy Note 9. On the UK Singles Chart, the song currently sits at number 47. In New Zealand, the song it made it into the top 10. The music video for “Thunderclouds”, which came out on August 30, 2018, was directed by Ernest Desumbila and features all members of LSD. The video also stars American actress and dancer Maddie Ziegler who plays the role of a young girl with a candy hair. Ziegler can be seen dancing on top of a car in the music video. It is worth noting that Ziegler gained worldwide stardom appearing in a number of music videos by Sia, including the music video of the worldwide hit single “Chandelier”. Listen to the chorus section of Bob Marley’s “Zion Train” below and be the judge. They are so similar that it would be greatly surprising if Marley’s record label and publishers don’t take some action against LSD in terms of copyright infringement. Do you think the two songs sound alike? We certainly think so! FYI: “Zion Train” was the sixth track from the 1980 album Uprising by Bob Marley and the Wailer. Nah, I don’t agree its similar enough to reach for lawyers… there is a school of thought which says every possible song/tune has already been done. Where does that leave copyright? Besides, since it was 1980, is there anyone left with the will for a long legal fight?